I decided to use it on chicken instead of on toasted bread and give it a little Indian touch. This has become one of my family’s favorite iftari this Ramadan. It is spicy ,tangy and salty all at once. Try this recipe as a starter when the guest arrives and i am sure they will love it. Trim the excess fat from the chicken breasts and cut each piece into four small piece. Combine chicken with all the ingredients in a bowl and add salt and pepper. Mix everything around to make sure the chicken is coated in the marinade. Refrigerate until ready to cook. and place chicken pieces on absorbent paper or paper towel to drain out excess oil. Top each piece of chicken with about ¼ cup of the tomato bruschetta topping and about ¼ cup of shredded cheese. It’s okay if some falls off, you can scoop it onto your plate along with the chicken. Serve hot and enjoy these yummy bruschetta’s! This entry was posted in International recipes, Non vegetarian recipes, Ramadan Iftar Recipes and tagged appetizers, bruschetta recipe, chicken appetizers, chicken bruschetta, easy recipes for kids, indian easy snacks, indian non veg recipes, indian non vegetarian recipes, italian chicken recipe, Italian recipes, quick snacks, Ramadan Iftar Recipes, ramadan recipes. Wontons are commonly boiled and served in soup or sometimes deep-fried. 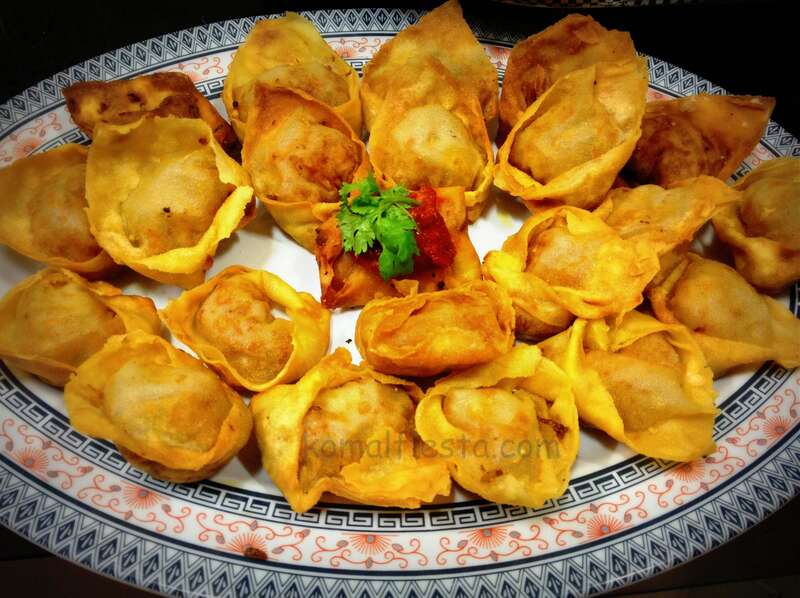 You can try your hand at making various unique fillings, and also steam or deep-fry the wontons as per your taste. To make the stuffing, heat 2 tbsps oil in a non stick pan. Add carrots, capsicum, cabbage and salt and toss. Add ginger garlic paste,red chilli powder ,vineger and soy sauce and mix. Add spring onion greens and mix. Cook till the vegetables soften. Take the pan off the heat and set aside to cool. Heat sufficient oil in a wok. Make a paste of cornflour with 2 tbsps water. Place a wrapper in your hand, place a teaspoon or tablespoon of filling and fold it to make a rectangle. Dab water on the left corner,push the middle inside and bring the right corner to the left corner,seel it tightly. Repeat with the remaining ingredients to make 9 more wontons. Heat the oil in a wok / kadhai and deep-fry in batches till they turn light brown in colour. Serve hot with schezuan sauce. This entry was posted in Indian quick and easy recipes, International recipes, Non vegetarian recipes, Ramadan Iftar Recipes and tagged appetizers, chicken appetizers, chicken wontons, chinese recipes, chinese wontons, indian easy snacks, indian non veg recipes, indo chinese recipes, non veg snacks, quick snacks, Ramadan Iftar Recipes, ramadan recipes. The ninth month of the Islamic calender is known as Ramadan also written as ramazan, ramzan or Ramadhan. Iftar is a meal that is served after the Magrib(evening prayer) azan to break the fast during the holy month of Ramadan. There is intense spiritual meaning to Ramadan for those who fast. During this festival people practice generosity by being charitable,family-bonding by gathering around the iftar table, spirituality by praying, and self-control by practicing good manners. All these habits build a feeling of peace, tranquility and self-satisfaction. According to tradition, Prophet Muhammad broke fast with three dates , and hence muslims break their fast with dates and or water. Many people enjoy the pleasure of hosting iftar parties at home where they get to greet their beloved friends,families and share the food together with the community. A variety of foods are prepared for the iftar meal which includes fresh fruit ,juices , haleem , grilled kebabs , samosa , cutlets ,shahi tukda and many many more such interesting appetizers. Ramadan is a very special month for me and hence I put in an effort to make this post wherein you can find such interesting Ramadan iftar recipes. On this page, you can find healthy veg/non-veg appetizers and deserts. Please put in your any suggestions or feedback’s or any kind of requests. Hope you all enjoy these recipes. Shami kababs are a popular Afghan and Indian variety of kabab, also famous kebabs found in Pakistani cuisine.Shami Kabab recipe is great snack made with mutton and chana dal.The basic ingredient for kebabs is usually mutton but it can very well be substituted by chicken or fish or even veggie.Kebabs are cooked well with spices and then grounded to a smooth mixture.Whole spices as they do not grind well in the grinder, people tend to buy shami kebab masala from market , but i normally like preparing masala at home..I am sure once you make them, you will be compelled to try them out again and again.click here for recipe..
the best party dishes as its universally loved by everyone 🙂 The un-fried prepared samosas can be refrigerated for a couple of days, this makes it quite easier during Ramadan. An hour before breaking the fast it can be deep fried and can be served warm.And remember one thing at start your samosa might get distorted , but “Practice makes perfect samosa” so never give up 🙂 am sharing the recipe for making chicken samosas with you all, a perfect treat for everyone during Ramadan and on any day.Read more.. These chicken kebabs made with noodles, chicken and potato go as an excellent dish for Iftari party or a starters. I am sure your guest will be quite impressed by this dish. Especially our junior guest kids love to eat such different and wonderful tasted food. This recipe was first introduce to me after my marriage by my in laws during Ramadan month and I was quite amazed as it tasted yummm !!! Chicken Lollypop is a very good luscious appetizer and its one of the kids favorites, and it tastes spicy & delicious with a combo of any sauce or dips. Coated with a luscious batter with garlic and ginger paste, and bread crumbs, makes it a perfect juicy luscious appetizer.Read more..
Malai kebab or Malai Tikka gets its name as malai/fresh cream which is one of the key ingredient of this dish.I wanted to try this juicy, melt-in-mouth succulent tikka from a long time ,finally I succeeded !!! Sharing with you this recipe of delicious and aromatic spicy creamy base chicken malai tikka.Read more..
You can try your hand at making various unique fillings, and also steam or deep-fry the wontons as per your taste. Read more..
Spring rolls, a classic chinese dish that is enjoyed by everyone, children in particular. I have kept the filling for the spring rolls really simple and quick, you can experiment with bean sprouts, noodles and other vegetables. The crunchy and delicious taste of these rolls makes it perfect to serve for Ramadan Iftar or parties.It tastes great served with schezuan sauce.Read more.. The bright, colorful, and refreshing fruit chaat is a perfect starter to a Ramadan Iftar meal. A combination of fruits and chat served with sev and tamarind chutney makes it delicious and energetic food. A must make item in Iftar. Chill before serving for more nice taste. Read more..
Seekh Kebabs is a recipe inspired from middle eastern tradition and terrific appetizers made from chicken or goat meat,they can also be served as side dish with the main meal.Since most of us don’t have ovens, most of us don’t try this easy recipe to make them at home , but you can prepare this dish by frying too. I tried out both the methodgrilled it in oven and by frying and trust me both came out with good taste. please read the complete recipe for the directions.Read more..
Momos are the famous fast food Himalayan origins. It’s a traditional delicacy in Tibet, Nepal, Bhutan, Sikkim and Northeast India. Momo(dumpling) are made with a simple flour-and-water dough—white flour is generally preferred ,it can be either steamed or fry. You can do Chicken/Meat or Vegetable stuffing in it. I tried chicken as my husband is fond of chicken and i gave little desi tadka to it hence fried it.Read more.. Looking out for a simple quick and easy starters/snacks here you go Suji/Rava Cheese balls makes a great starter recipe and will be loved by all age groups. It can be served with fries,creamy coleslaw or a simple tomato ketchup dip.Read more..
Green chicken/Hariyali Murgh is a nice change from usual red chicken curries which we usually made at home.Its a delicious mild spicy and full thick gravy cooked in coriander ground paste which adds a great aroma to this dish. What is special about this recipe,the curry is very simple to prepare yet it looks and taste like restaurant dish.Read more ..
Chicken rezala ,also know as white chicken is another royal famous Bengali dish with delicious aroma.This dish is a perfect combination of cream and cashews in chicken and other spices which add tons of flavour to the dish. Just a magical dish with its aroma, texture and taste and serves as a perfect food for the whole family.Do watch the video to learn how to prepare chicken rezala with very easy steps.Read more.. Spinach (Pala k) along with other green leafy vegetables is rich in iron.Lets try out this iron rich recipe with chicken.Read more..
Chicken curry with poppy seeds, cashew nuts and spice is a very popular chicken recipe .It is a rich and aromatic curry that makes a wonderful meal for the family. It can be served with plain steamed rice or with chapatis.Read more..
Prawns(Jheenga called in Mumbai) is an Indian curry recipe originated in Goa and i got inspired from my mom’s kitchen. This Goan recipe is prepared from it’s typical Goan ingredients like coconut and spicy red chillies.Hot and sour is the best way to describe this dish.Read more..
Khajur (Date) is the main food consumed in the month of Ramadan. It has many health benefits like dates are easy to digest so they don’t exhaust the fasting person stomach.Dates decrease the great hunger feeling of the fasting person and it also prepares the stomach to receive the food after being inactive through out the day with activating the release of digestive secretions and juices. Dates protect the fasting person from having constipation as a result of changing meals times or as a result of having low fiber amounts in meals.Read more..
Having Kiwi fruit has many health benefits in the month of Ramadan since fasting can also lead to increased acidity levels, which might lead to indigestion.The actinidin contained in kiwi fruits can also help aid in the digestion of foods that are of dairy, meat and legume source hence I prefer to have this fruit but normally they are little sour in taste , so I don’t enjoy them much. Yesterday I found the Kiwi’s at home were little ripe.I just didn’t wanted to discard them off , I thought of preparing its milkshake but with Banana and to my surprise I discovered Kiwi and bananas go together very well.Read more.. 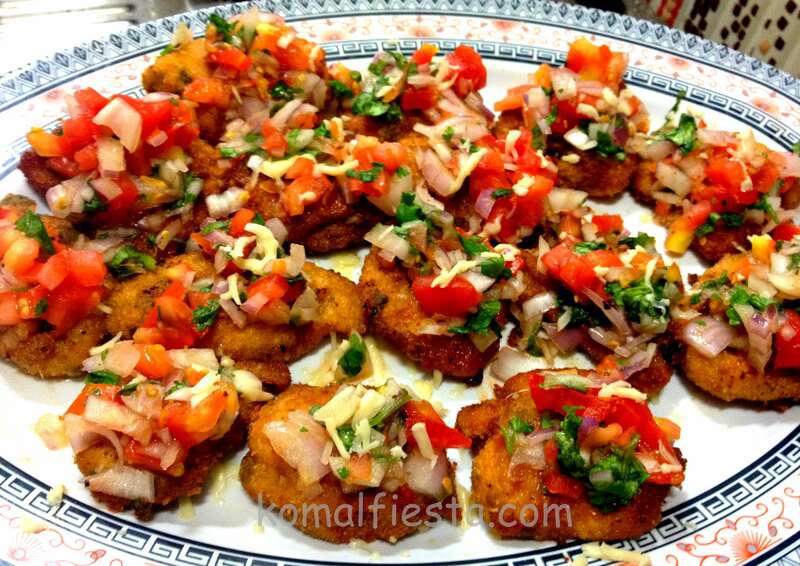 This entry was posted in Indian quick and easy recipes, Ramadan Iftar Recipes and tagged appetizers, chicken appetizers, Drinks and Beverages, iftaar recipes, Ramadan Iftar Recipes, Snacks. Take one piece of bread ,place cheese slice over the bread in a single layer. Top with another slice of bread. Cut the bread evenly into 9 pieces. Repeat this will the remaining bread and cheese slices. Take chana powder, ginger garlic paste (if u don’t have paste ready skip it) garam masala powder, pav bhaji masala powder and chilly powder in a bowl and mix well. Pour water in it and blend into medium thick batter. Flavor with salt to taste. 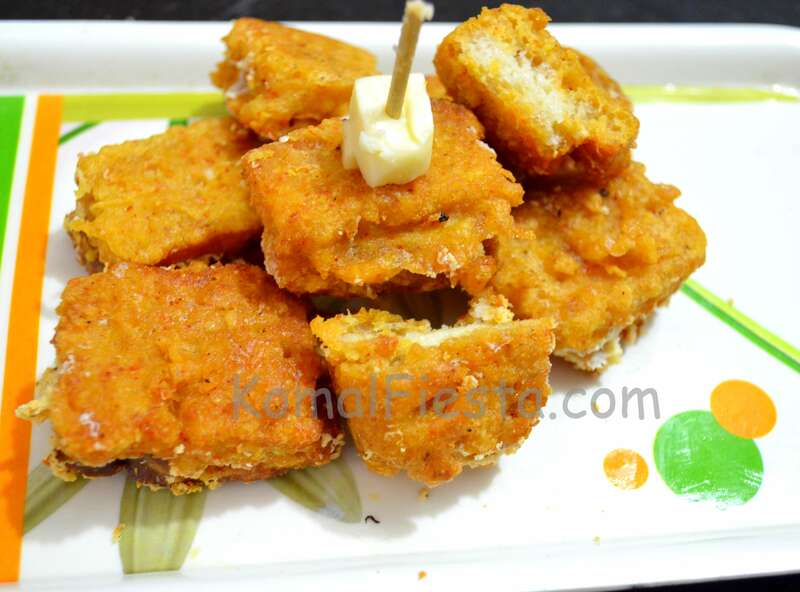 Immerse the bread pieces into the chana batter. Heat oil in a pan and fry the each bread piece until light brown in colour. Serve hot with ketchup or any green chutney. Coat the bread evenly with the batter so avoid the cheese spread out into the oil. This entry was posted in appetizers, Indian quick and easy recipes, Ramadan Iftar Recipes, Snacks and tagged appetizers, bread cheese bhajiya, bread cheese pakora, bread pakora, bread recipes, indian pakora, innovative recipes, leftover bread recipes, pakoda recipes, pakora recipe, Ramadan Iftar Recipes, ramadan recipes.